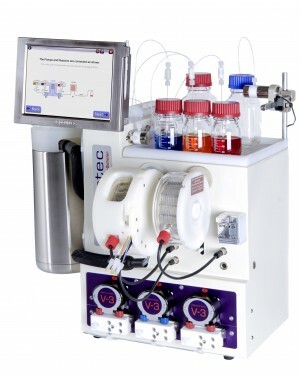 A continuous flow procedure for the gem-dichlorocyclopropanation of alkenes has been developed. The method is based on the generation of dichlorocarbene utilizing the classical biphasic aqueous sodium hydroxide/chloroform system. This reaction typically requires vigorous stirring for several hours in batch for completion. Tarry materials precipitate due to partial polymerization of dichlorocarbene and the process is difficult to scale. To overcome these problems and achieve very efficient mixing during the flow process a column reactor packed with PTFE beads as inert filling material has been used. PTFE beads have been found to be the optimal material to obtain fine dispersions of the aqueous phase in the organic solution. By heating the packed-bed reactor at 80 °C excellent conversions have been achieved after a residence time of only 4 min. 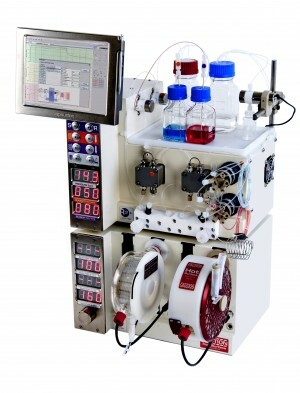 The process has been applied for the synthesis of Ciprofibrate, a dichlorocyclopropane-containing drug used as treatment for several diseases associated with high lipid content in blood.